You know those projects that you start and then never seem to be able to finish? I finally finished one yesterday. Back in 2003, I started working with my grandma to write her life story; this week it was finally published. The project started by recording over two hours of Grandma talking about her life — starting at birth and chronicling all the major, and even some minor, events until the present. Next, I transcribed all the audio and formatted it into a story. I printed this out and sent it to Grandma to revise. Since she doesn’t use a computer, she literally cut up the pages and taped them back together, using extra scraps of paper taped onto the sides to add new paragraphs; there were arrows going everywhere. After she was done, she would fold in all the tabs, put it into a large envelope, and mail it back to me. I would then spend the next few weeks deciphering what I got back and making the changes in the computer file. We went through this revision process at least three times over the next three years. Next, I sent the file to my uncle to insert photos into the story. After the photos were inserted, every change that Grandma wanted me to make to the text would require hours of formatting to re-align each photo — I learned that Word is NOT a good tool for publication projects. Eventually, we finished her life story. I spent the next year putting together various photos, pedigree charts, and other files that Grandma wanted to include in the published version. About two weeks ago, I finally got everything together and started working on preparing it for the publisher. Mom helped Grandma design the book cover while she was in Mesa last week and I uploaded the file. We were finally ready! This project had been in the works for so long that when it came time to click the final button to have it published, I almost couldn’t do it. The final product is 75 pages long and I have been working on it for most of my married life. I am so anxious to see how it turned out; I don’t know if I can wait until Tuesday for Grandma to receive the shipment. Hopefully she sends my copy fast! Theoretically the results of the bar exam aren’t supposed to be out until tomorrow, but Kim decided to check today just for fun. Lo and behold, there in front of her was the list of people who had passed. She quickly scanned down the page looking for her name. She got really anxious as she scanned the D’s since she still isn’t used to finding Dewey in a list. She had to go through the alphabet song a few times as she scrolled to make sure she hadn’t passed the area where it should be. Finally she found it: Kimberly Anderson Dewey. A combination of relief and excitement was felt knowing that it has finally come to an end, and that the three years were worth it. I am super proud of her, and I am going to love being able to tell people — “This is my wife Kim. She’s an attorney.” That will be fun. And how did we celebrate you ask. We had blood drawn for our life insurance. But don’t worry, we will celebrate soon. 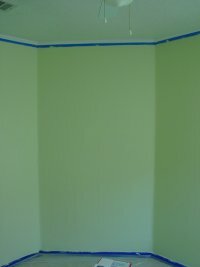 My latest project adventure involved transforming the dark red office into a bright sea-foam green baby nursery. 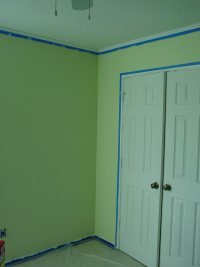 I started by painting the baseboards and taping the entire room. As usual, I was highly optimistic about what I would be able to get done in one day. I thought I would get everything taped up and primed on a Saturday, and then I could finish the painting on Monday. Well, also as usual, I didn’t get quite halfway through everything I expected to before it was time to call it quits. In my defense, it is harder to get a lot of things done where there is a cute little baby around that needs holding, but it took most of a Saturday to get the doors, window, outlets, crown moldings, and floor taped. 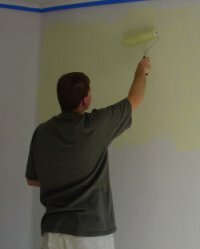 Next I applied a special heavy-duty primer that was supposed to cover dark colors in one coat. Naturally, I put on two coats just to make sure there wouldn’t be any red showing through. Once the primer was dry, I applied the green paint. It looked quite yellow at first and we were worried that the room wouldn’t turn out the way we wanted. 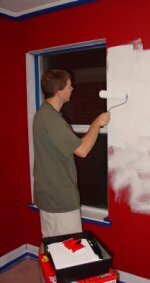 As the paint dried, it changed to a neon shade of lime (which gave the room an eerie glow when you looked down the hall) before finally drying the color that we intended it to be. It is a whole new room now. In fact, every time I look at this picture with the red paint I am surprised at just how different and dark it was. Now we can finally start moving all of the baby stuff out of our room! Next up on my project list…finish the baby’s dresser. Stay tuned! !